As nice as the scones were at Ellenbrae Station, we set off the next morning, all very excited, as finally the day had come where we were actually going to cross the famous Pentecost River. 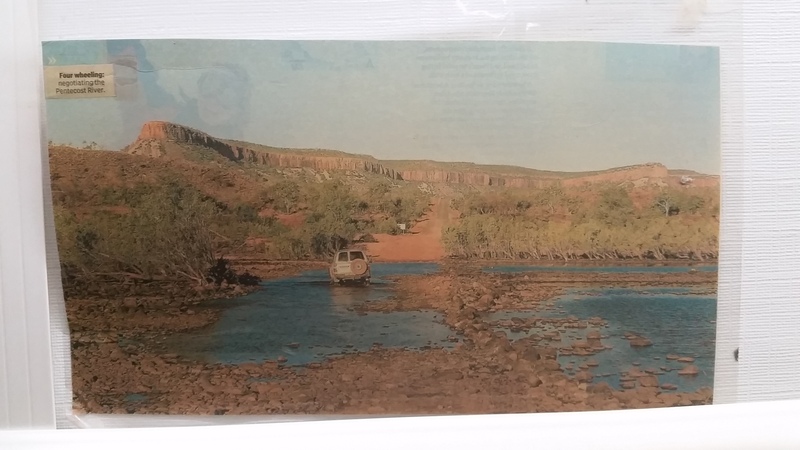 A very distant 8 years ago I had cut out a photo of a car crossing the Pentecost with the Cockburn Ranges in the background, I then got it laminated and it has been on our fridge ever since. As expected the photo simply did not do it justice, both the crossing and the ranges behind was an awesome sight to behold and I am very pleased and thankful to be able to have it forever imprinted in my mind, in addition to the few photos, drone and go pro footage we took as we ended up going back and forth about 6 times each. Both Nik and I had a go at driving it, with me being a little bit more nervous the Nik, however disappointingly we didn’t spot a saltie lurking in the shallows. My old laminated newspaper photo that has been on our fridge for 8 years. 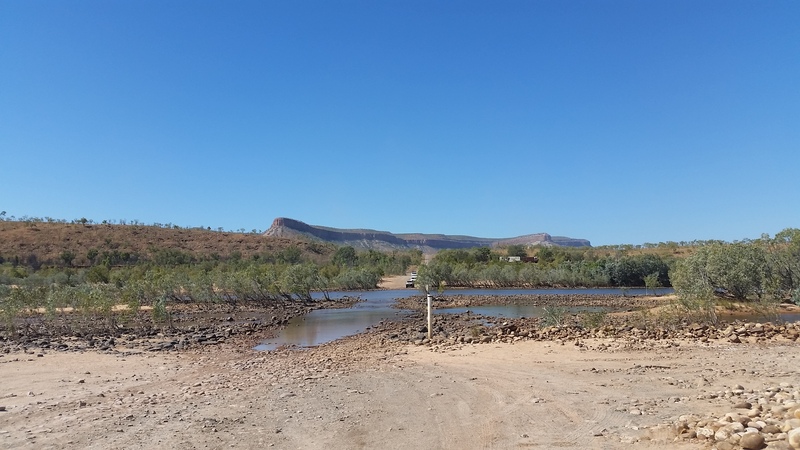 The almighty Pentecost River crossing, with the Cockburn Ranges in the background. And away we go, Nik’s turn first. And back he comes for my turn. 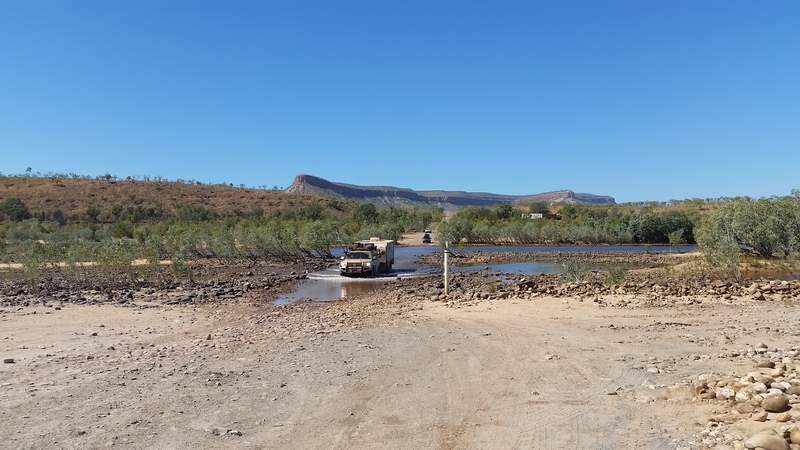 After we pretty much dragged ourselves away from the crossing we then continued on a short distance to our next stop, El Questro homestead. 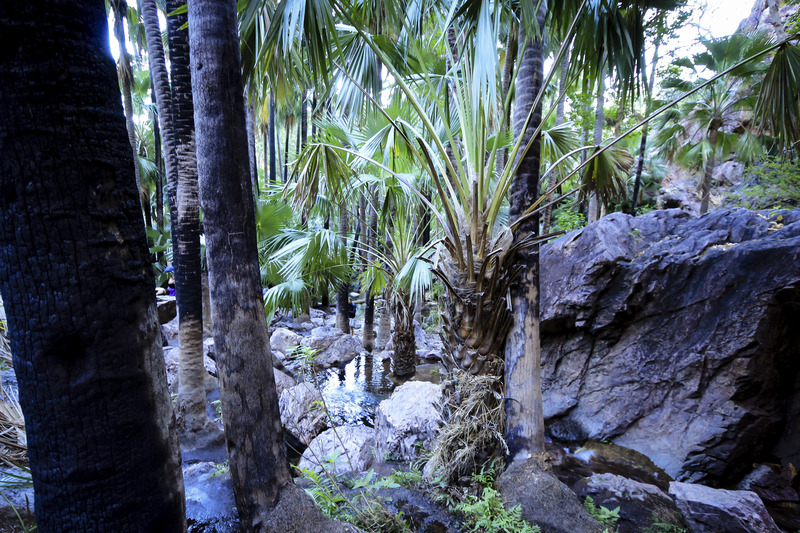 El Questro Wilderness Park is over one million acres in size and is located on the eastern end of the GRR. It is a very popular holiday destination for travellers from all demographics, for the high rollers there is the homestead accomodation costing $2,500 pn, Emma Gorge Resort for the non campers and finally the station accomodation (much like a caravan park set up) for us campers and caravaners with a little less coin to throw around. 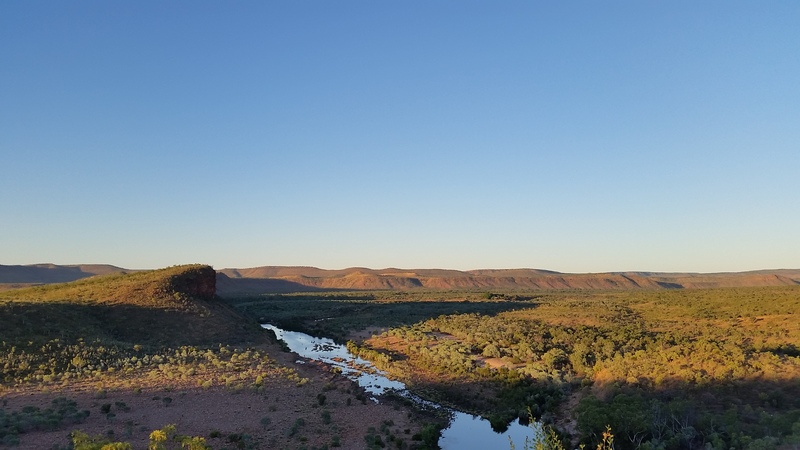 The attractions around EL Questro are absolutely stunning and fortunately 75% of them are available for everyone to see by 4WD, which is exactly what we did during our 4 night stay here. 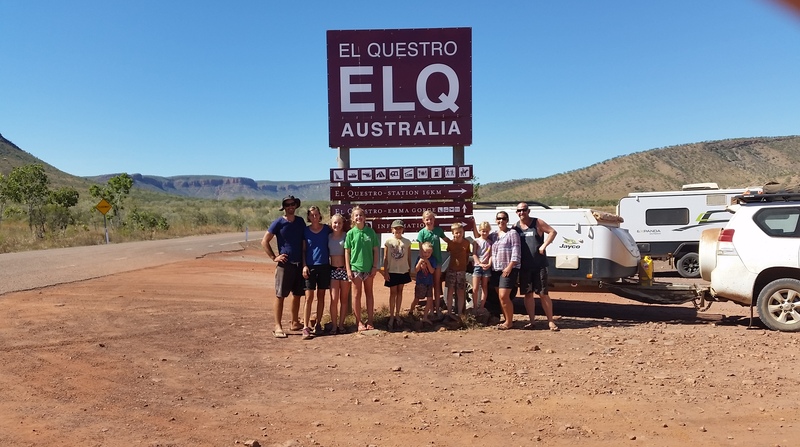 The ‘Smeeds’ arriving at El Questro. 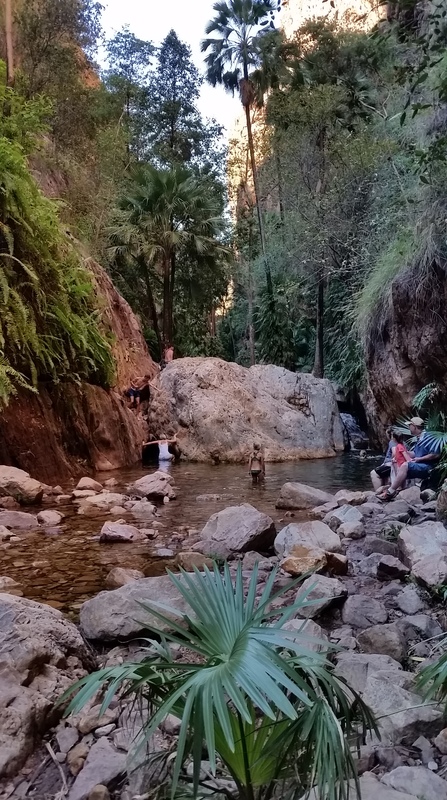 First stop for us was El Questro Gorge which involved hiking along a spring fed creek surrounded by shady palms and ferns. 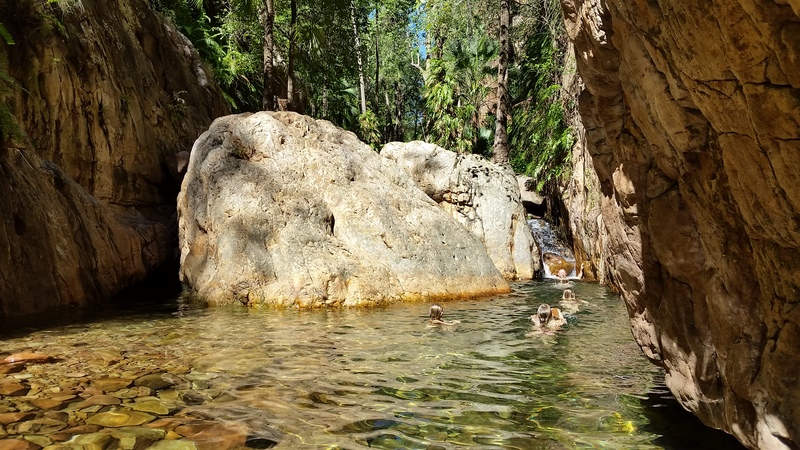 The tough hike took us over 4km into the gorge where we climbed up boulders, hopped over rocks and even scaled up a waterfall to reach our final destination of McMicking Pool, the clearest and deepest swim hole we had seen. Amazing!!! 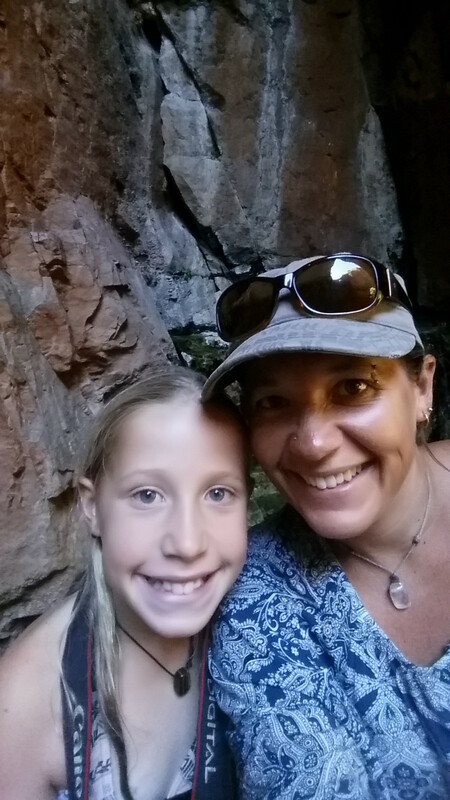 Start of the El Questro Gorge hike. The halfway mark at appropriately named Halfway Pool. Take note of the huge boulder I oh so elegantly manoeuvred my way up…. 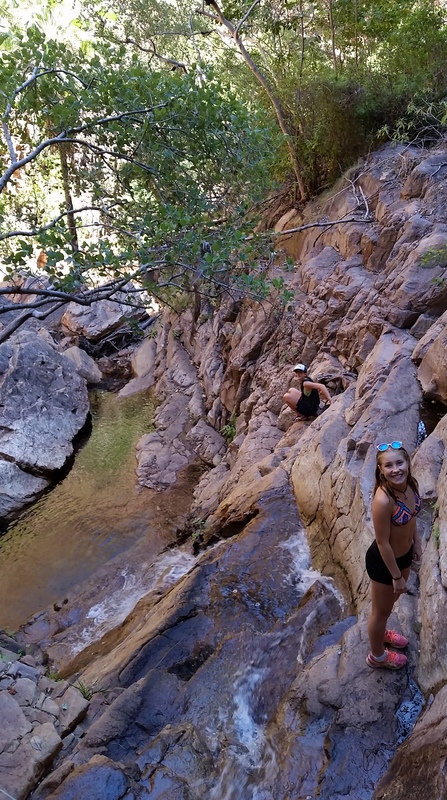 The waterfall that we had to climb up. The end result, McMicking Pool. Cooling down with a dip in Halfway Pool on our way back out. The next morning we awoke bright and early and arrived at Zebedee Springs by 7:15am, to hopefully beat the mad rush, in particular the many, many tour buses. The crowd wasn’t too bad, probably about 20 of us there, however Nik was clever enough to walk up to the top of the springs and managed to nab us the perfect sized pool that practically built for the Smith family. 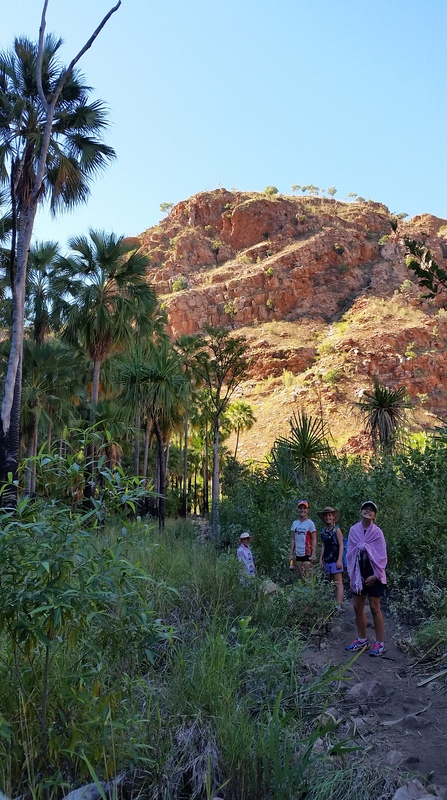 It was ablsoute bliss lying there in the 28 degree crystal clear water looking up at the many palms, red cliffs and blue sky. I could have stayed all day, however after an hour we hopped out and went back to the car where we had our breakfast and watched car after car roll in, by the time we left there would have been about 50 cars there and 1 tour bus…. Nik heading up to the top pool. 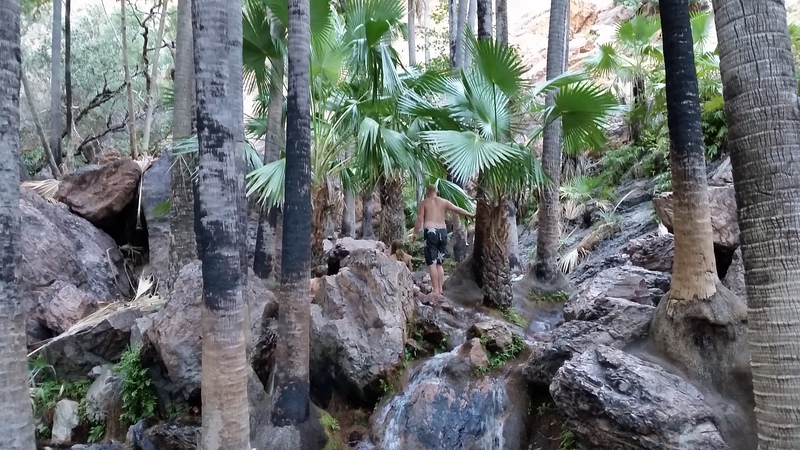 Zebedee Springs from the top pool. 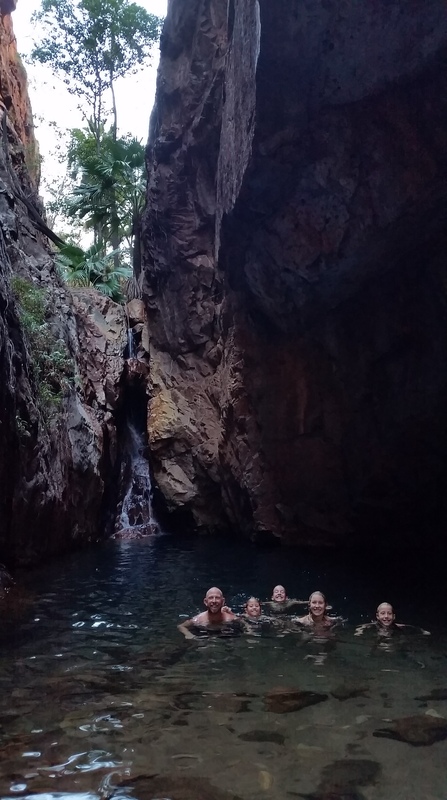 After our relaxing soak and breaky we packed up and headed across to Emma Gorge Resort, where along with about 200 other eager tourists we hiked the 1 1/2 kms up the creek to be rewarded with yet another stunning gorge and crystal clear swim hole. 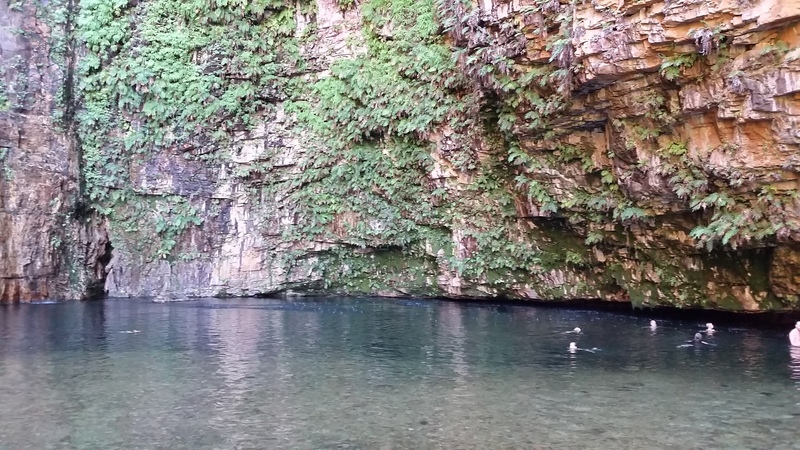 Emma Gorge was yet another highlight as the kids had a ball swimming and trying to duck dive to the bottom of the gorge. After a while though, the crowds started to roll in so we thought it best to start the slow tedious walk back, stuck behind the tour groups who weren’t too keen to let the younger, faster hikers past. We finished up eating lunch on the lush green lawns at the resort before we headed back to our van at the station for a very quiet afternoon. 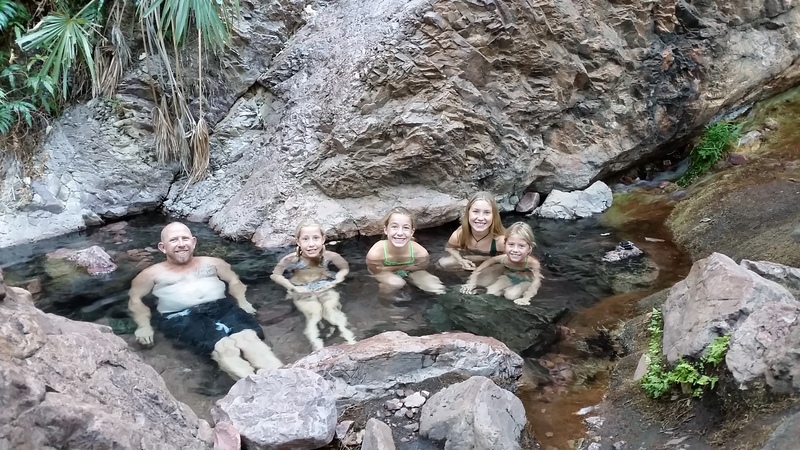 Cooling off in Emma Gorge. View from above the water fall. 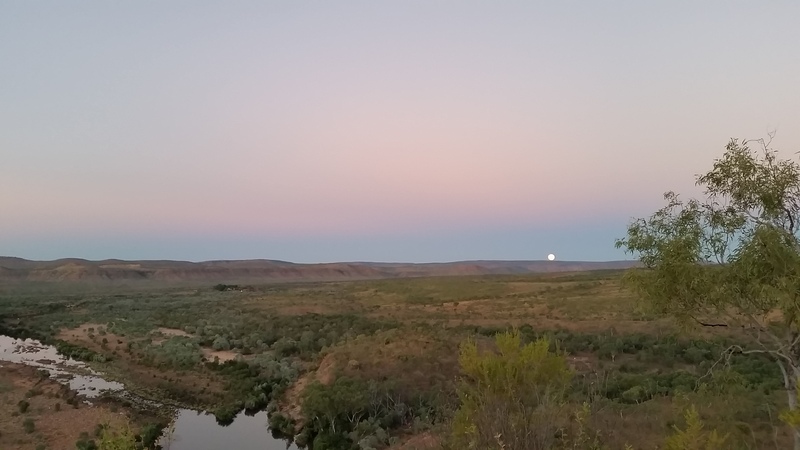 Whilst at El Questro we took a 4wd up to Branko’s Lookout where we sat and enjoyed the sunset overlooking the Pentecost River, no sooner had the sun gone down than the biggest, brightest and fullest moon arose from the east, as the usual the photos just don’t do it justice. Brancos Lookout to the west. Brancos lookout towards the west. Brancos Lookout towards the east, the homestead is in there somewhere. The full moon rising over the horizon. On our last afternoon/ evening at El Questro we had a farewell meal and yummy desert to celebrate our time spent travelling with our mates, the Leeds, which in total has been 6 months on and off over for the last 15 months. We had a great time eating, reminiscing and reciting all the places we had camped and the experiences we have shared together, however with the sugar hit kicking in it wasn’t long before the kids started running around and playing a game of highly charged 40/40 home. The next day it was hard to say a final goodbye, however as we will be heading over east next year (where they are are heading and settling) we decided to instead say see you later. 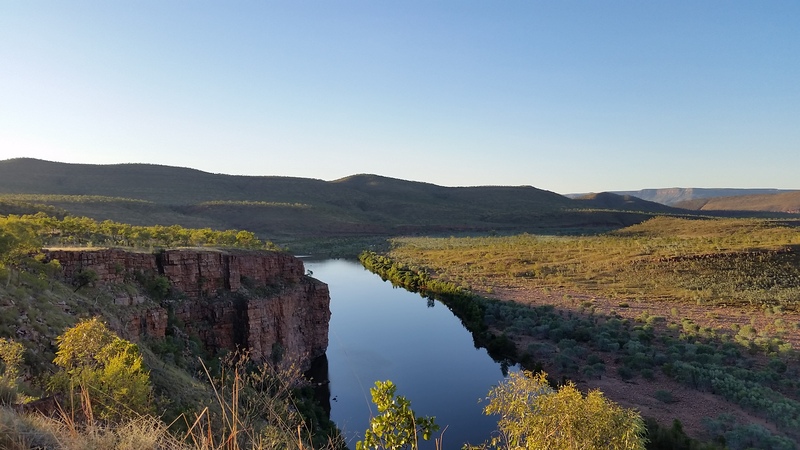 As we drove off, we pondered with the idea and possibly of a reunion, perhaps Cape York as the destination………. 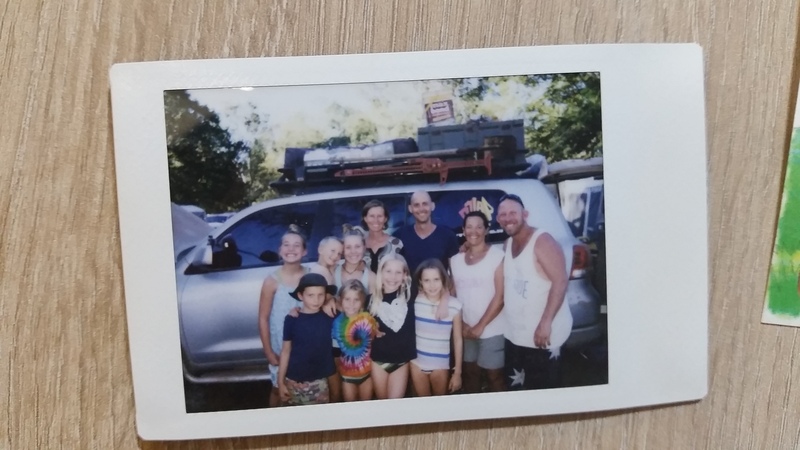 The final travelling Smeeds photo taken at El Questro, done in polaroid and heading straight to the bar room, Kerrigan style!!!! 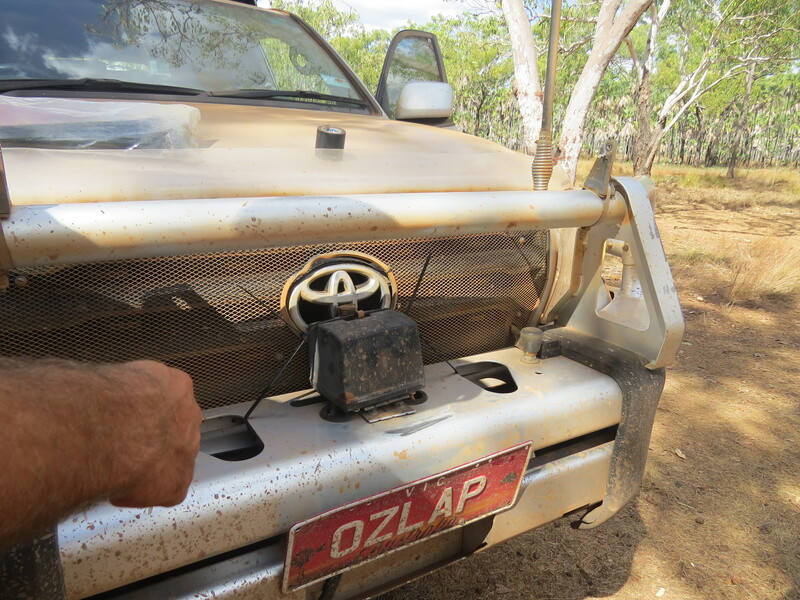 And so finally the last 20 odd kms back out of El Questro was the final offering of dirt that the GRR had for us, with the rest of the road being bitumen back to the highway. In summary, whilst we were expecting some damage and mishaps to both car and caravan, we felt that we came away relatively unscathed, our casualty tally combined with the Leeds, ended up being a snapped antenna, busted light bar, broken winch controller mount, loss of water from water tanks, broken caravan lifting arm, a few broken guards under the front passenger wheel and lastly a busted caravan shocker discovered just before El Questro. Fortunately for us our storey differed to a lot of others, with broken axles, broken trailer welds and shredded tyres to name just a few that we had heard of, perhaps our lowered tyre pressure and easy going (OK, read slow) pace was to our advantage, as we were passed by quite a few cars doing ridiculous speeds as they overtook us. 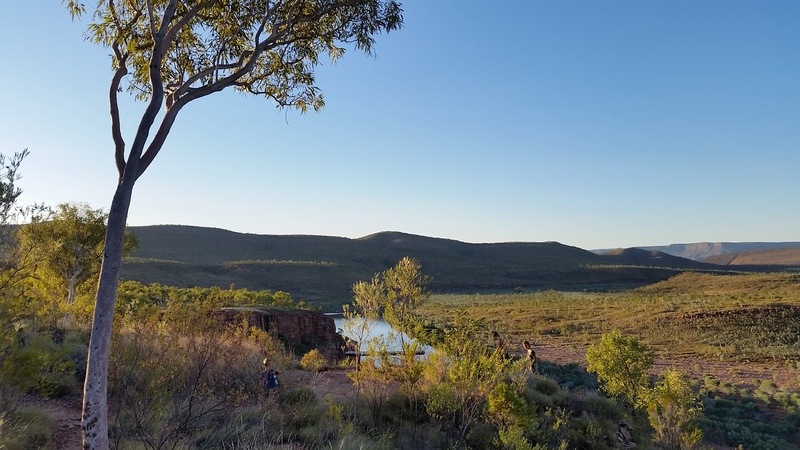 Places we stayed – Silent Grove (2 nights), Charnley Station (2 nights), Manning Gorge (3 nights), King Edward River (2 nights), Mitchell Falls (1 night), Ellenbrae Station (1 night), El Questro (4 nights), totalling 15 nights. fresh food ran out at about the half way mark, a few mandarins and apples were purchased from Mt Barnett Roadhouse. 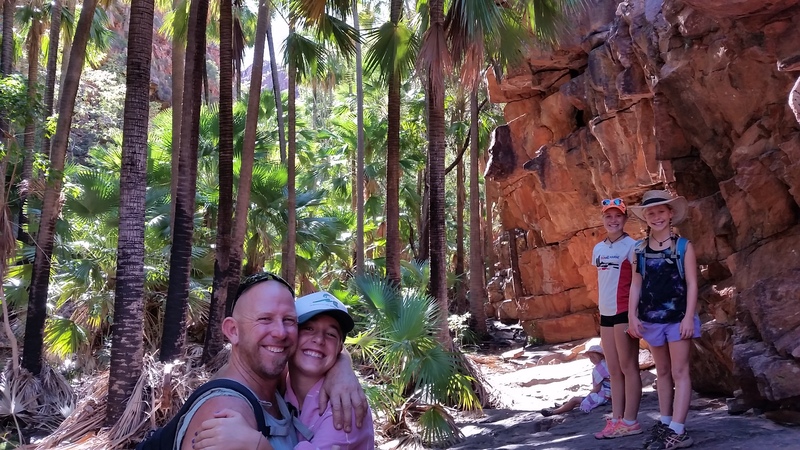 Our favs – Nik: El Questro Gorge, Amy: Manning Gorge, Bec: Manning Gorge, Zoe: El Questro Gorge, Abby: Manning Gorge and El Questro Gorge, Jess: Bell Gorge and El Questro Gorge. The end result, held together by cable ties. 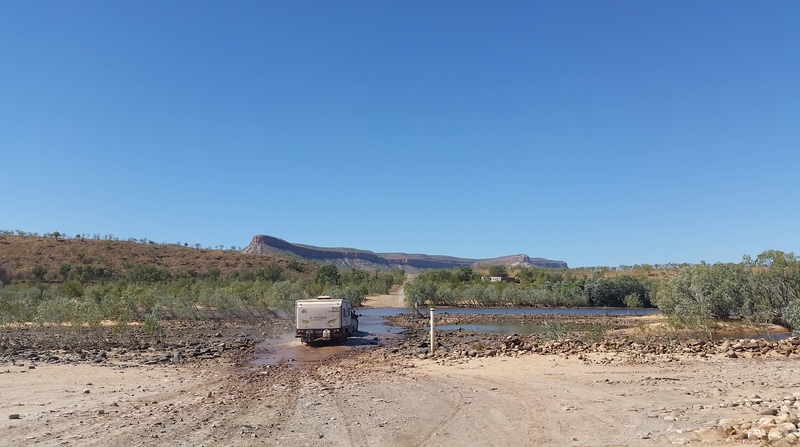 Previous Previous post: The Gibb River Road, part two. Western Australia. 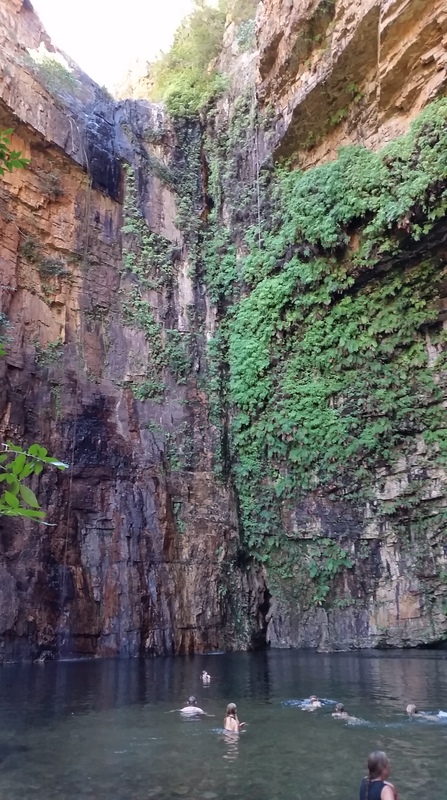 Next Next post: Purnululu National Park ( Bungle Bungles), Western Australia.